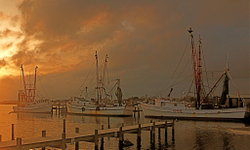 I snapped this shot of shrimp boats at anchor today near Swansboro, NC. When I was taking the picture, I was reminded of some clients who sold their two homes and have purchased a sailboat which they plan to use as a home for the next five years. The three shrimp boats are still actively plying the waters of the North Carolina coast so they are not available as homes for Northern Virginia residents who are having trouble meeting their mortgages. I just read the Post article, Housing Rut Derails Host Of Dependents. It is probably not news to anyone that the downturn in the real estate market is causing problems across the country and across industries. As someone who helped buy a home in the Reston area, I know what a hot market looks like. I was amazed how difficult it was to get a home. As a new Realtor® working in Cape Carteret, NC, I can certainly feel the pain of others in this market. It seems like I spend money and see very little come back into my bank account. I became a Realtor® with open eyes, but also with the hope that it might be a field where a little age was appreciated. That is certainly not the case in some technology companies. The real estate industry is full of older people. It offers you a place where you can work at your own speed and where people are responsible for their own results. It isn't a bad deal in a good market. In a down market, it is tough. Most real estate agents are like me, independent contractors. We make no salary, get no benefits, and we actually pay to have a desk and to have access to MLS systems. It ends up costing a fair amount just to be a Realtor® each month whether or not you sell anything. Still it is a choice I made, and eventually I think it will be a good choice. Our coastal market was once just as hot as the Reston market. Now it has cooled substantially and since the first of the year, buyers have been waiting to make a move. No more are we faced with a market so hot that properties are sold before people can even get emails about them read. Now we have buyers who look at lots of homes, hoping to find the perfect one. After a while in real estate, you learn there is no perfect home. The best you can do is find the one with the least number of compromises. Reston is a strong housing market, it will be back long before our coastal one. Still it is interesting to see the differences. If Reston had some of our properties, they would probably sell out overnight. I imagine single family homes with 3 bedrooms and 2 baths, 1600 square ft. on .38 lot within 7 miles of the beach would sell fairly well in Reston at $199,900. Of course it is impossible to have a home like that in Reston. Where we are have plenty of them waiting to be sold. Today I even saw a sound front home on one acre, 2400 square ft, with 4 bedrooms and 3.5 baths at $699,000. We even walked around a waterfront cottage of around 1,600 square ft. that has a listing price of $295,000. I haven't checked out Reston's prices recently, but I remember well that at one time you were lucky to find anything but townhouses in $400K to $500K range. It is a little ironic that our "vacation" area on the coast has more affordable homes than Reston. Reston and Northern Virginia have far more jobs which means it is likely housing would cost more. also the coast is home area of choice, people chose to live there and rarely transferred there because of a job. People also retire there and sometimes don't even need jobs so if homes get too expensive, you just do not live there. In Reston if homes are too expensive, you take on a longer commute. Surprisingly our area has traditionally not been an area of huge homes. There are some but most of the homes in the area are from 1,600 to 2,400 square ft.
As a real estate agent fully aware of supply and demand, I know that housing in the Reston area is bound to be more expensive. Land just isn't available like it is here on the coast. While waterfront properties are little challenging to find, we still have lots of pine forest for less expensive homes. I think is pretty close to bottom of the price drops. I recently sold a 2,500 square ft. home for $350K. It was in a nice water access community and came with a boat lift. The home had sold for $345K new a little over four years ago. That basically means the real estate bubble has seen most of its air disappear. Prices have been reset, though there are still some buyers holding onto pipe dreams. I will look forward to prices in Reston stabilizing and moving forward. That might be the sign that our market is headed back towards normal times. In the meantime there is lots of work to be done, especially making sure that Coastal NC is well known before people start making their retirement decisions. The good news is that all my technology buddies are doing a great job of coming up with new tools. I just brought up a new website today about Coastal Carolina. It was the easiest one I have ever done and has the most features out of the box. I am truly impressed. I am thankful that some folks are making my job easier. In a tough market, anything that makes your job easier is welcome. Of course living in a great place where there are lots of reasons to be happy does not hurt either. It ends up being easy to be hopeful for the future when the scenery can restore your soul.